Claire Abby is like any other seventeen-year-old girl in 1986. The boys in The Suburbs, MN are the pits, school is entirely too much work, and her snotty, lipgloss-wearing nemesis has the locker next to hers. The only thing that can save her from her miserable existence is her best friend, Jane, and her favorite band in the entire world, Banks Forest. Their music is the ultimate escape and their guitarist, Christopher Penman, is the ultimate imaginary boyfriend. A real boyfriend seems as likely as the A Honor Roll until Tommy B, a boy she’d never thought about twice, actually seems to like her. Sort of. Sometimes, he’s a jerk. Other times, he’s as sweet as can be. Christopher Penman, however, is always sweet–smiling from the posters on her wall, telling her everything will be alright. When Claire discovers Tommy has a secret, she learns that the only truly safe place is with Christopher, even if it’s only in her dreams. Claire’s Diary is one of two prequels to "Bring Me Back". The second is "Save a Prayer". I was pretty sure Tommy was a sweet guy and he’d saved me from the humiliation of dealing with Holly, but I wondered for a second if I was the dip$* girl in an after-school special with blind trust for a boy she’d ended up with by accident. It was as if God had whispered in my ear that I would have one last growth spurt and become a C-cup – hearing a boy say that I smelled good made my head swim with possibilities. Hardly anything ever turns out better than I imagined it, probably since I’m so good at imagining amazing things. She’s a stupid twit, who will probably end up being the assistant janitor at Dairy Queen. 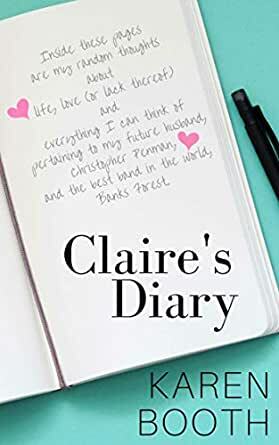 With Claire’s Diary, Karen Booth magically inserted me completely within the psyche of a teenage girl. She totally captured the awkwardness, insecurity, uncertainty and angst of dealing with mean girls, first sexual experiences, first boyfriends, pimples, parental inquisitions, bedroom band posters, and high school locker drama. It was brilliant. 5.0 out of 5 starsSo much emotion packed into this short story!! There is so much emotion packed into this short story!! While those who have read Bring Me Back and Back Forever are going to get the most out of this book, I think any reader will appreciate Claire's coming of age story. This narrative so perfectly evokes those years of slowly letting go of teenage crushes on movie and rock stars (well, some of us never stopped!!) to begin navigating the tumultuous relationships with high school boys and losing the V card. For those who have read Bring Me Back and Back Forever, getting a look into Claire's early life is heart warming. We meet her kooky but loving mom and see her passionate crush on Christopher Penman. If you're a Duran Duran fan, pay special attention and you'll see Ms Booth gives a nod to DD (especially John Taylor) throughout the book! A short story told from teenager Claire’s (of Bring Me Back (Forever Book 1) and Back Forever: The Sequel to Bring Me Back) point of view. She thinks she’s in love with Chris, lead guitar of the band Banks Forest. The cute twist is that she ends up in a real relationship with Chris in Bring Me Back and Back Forever. Full of teen angst, sexual awakening and learning the hard way who the good guys are. Karen Booth is so good! I have a collection of her books. She gave me a copy of this to review. Woops, I haven't read the larger first 2 books yet, which is apparently recommended. It doesn't matter to me because I still really enjoyed this little read and am really looking forward to reading the others. Really well written, great characters and set in the 80s. Very well done.